The country has been notably unable to make use of its former chief executives. The day a president leaves the office his executive power is gone and he becomes a has-been overnight. He reappears at the White House only at the invitation of the incumbent. The most publicized return of an ex-president followed Kennedy's call to Eisenhower to join him at Camp David, the presidential retreat in the Catoctin Mountains of Maryland, after the failure of the ill-conceived Bay of Pigs invasion of Cuba in 1961. New in office, Kennedy was clearly hoping to have not only Eisenhower's counsel but also the prestige of one of the most popular presidents on his side. Herbert Hoover, however, did not set foot in the Oval Office throughout the twelve years that Franklin Roosevelt, his successor, occupied it. In 1945, when Harry Truman, who had succeeded FDR, invited Hoover, who happened to be in town, back to the White House, Hoover wept with amazement and pleasure. Jefferson in retirement became famous as the Sage of Monticello occupied with the planning and the building of the University of Virginia. James Monroe in his post-presidency spent much of his public energy in lawsuits against the federal government. He claimed real and imagined expense-money as due him for his services abroad as a diplomat. Although Congress twice voted him substantial sums, he continued to feel short-changed. After an unhappy presidency full of frustrated plans and hopes, John Quincy Adams returned to Washington as a member of the House of Representatives and served with distinction for seventeen years. He earned there the reputation of "Old Man Eloquent," the most insistent antislavery voice in Congress. John Tyler at the request of the Virginia legislature accepted the chairmanship of the "peace convention" in Washington in 1861, seeking to find a way out of the secession crisis. When the Senate ignored the convention's proposals, Tyler became himself a secessionist and won election to the Confederate House of Representatives. The presidency's burdens are understood and shared by those who have held the seat of power. 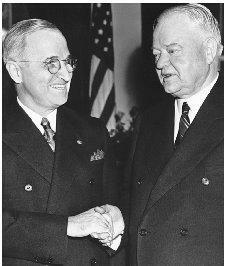 Harry Truman (left) and Herbert Hoover, though members of opposing political parties, enjoyed a warm friendship and are shown at the White House during Truman's term. addiction that appears to be irreversible. In a now-famous quip, Harold Ickes, who served in Franklin Roosevelt's cabinet, said: "When a man has been bitten by the presidential bug, he begins to suffer from a terrible disease that is only cured by embalming fluid." President Grant, following an around-the-world tour in 1879, wanted to run again in 1880. Failing in his goal, he spent his last years writing what would prove to be the most widely sold book ever written by a president—his remarkable Memoirs, still in print today. They cover not his terms in the White House but his years on the battlefields of the Civil War. Theodore Roosevelt, who was only fifty years old when he left the presidency in 1909, had expressed the hope even as he entered the office eight years earlier that he would not be "a loose cannon on the deck" when his term of service was over. But he spent the next years working to win the presidency again. One of his opponents was William Howard Taft (1909–1913), recently his closest friend, whom he had turned into a resolute foe. Taft had said privately in the run-up to the election: "If you were to remove Roosevelt's skull now, you would find written on his brain '1912."' The winner that year was the Democrat, Woodrow Wilson. Shortly Roosevelt was harassing him, too, maintaining that Wilson was not sufficiently active in countering Germany's violation of American rights on the high seas. Soon after Wilson's reelection in 1916 and the entry of the United States into World War I, Roosevelt applied to Wilson—in vain it proved—for a commission to lead an American army into Berlin. Taft in his after-presidency gave a series of instructive lectures on the office at Columbia University, published as Our Chief Magistrate and His Powers (1916). Yet his heart and mind were bent on returning to the judicial bench where he had once sat. Indeed, in Taft's days in Roosevelt's cabinet, the president, speaking in the manner of a fortune-teller had one evening teased him and Mrs. Taft: "I see a man standing before me weighing about 350 pounds. There is something hanging over his head. I cannot make out what it is. At one time it looks like the presidency—then again it looks like the chief justiceship." With unfeigned glee Mrs. Taft shouted: "Make it the presidency." "Make it the chief justice-ship," responded Taft in a quiet voice. In 1921 President Harding appointed Taft to be chief justice. Taft is still the only man to have served in two of the three highest offices in the land. And drawing on the immense prestige this singular fact appeared to entitle him to, he continually irritated Harding and Harding's successor, Calvin Coolidge, with suggestions respecting vacancies to be filled on the Supreme Court. Hoover, in his long post-presidency, rendered valuable service on two national commissions he headed to streamline the operation of the federal government. Nixon, the only president forced to resign his office, spent his last years writing not only his memoirs but also a series of works on foreign affairs. They were planned both as instruction to the public and to help rehabilitate their author's reputation by highlighting what he regarded as his expertness on international politics. Carter kept a high profile as an ex-president. Having created the Carter Center in Atlanta, a nonprofit organization to promote peace and human rights, he took on various projects including helping to encourage and supervise elections in other countries. Through the Jimmy Carter Project of Habitat for Humanity International, he and his wife, Rosalynn, helped construct houses in New York City slums. In the television era, former chief executives do not disappear from the public eye, as Truman did. They may be seen every so often on talk shows and occasionally they are rounded up as a group—as, for instance, on the occasion in November 2000 of the two hundredth anniversary of the White House. With the exception of Ronald Reagan, all of the living former presidents were prominently present at the memorial service in Washington's National Cathedral for the victims of the 11 September 2001 terrorist attacks in New York City, Washington, D.C., and the hijacked airplane that crashed in western Pennsylvania. Past presidents are in demand as public speakers, not so much for what they have to say, but as glamorous attractions at business and charitable gatherings. Reagan was widely criticized for accepting $2 million for two appearances in Japan, soon after he left the White House in 1989. But the practice of "cashing in" is now accepted. The commander-in-chief in his post-presidency is recognized as a celebrity-in-chief. George H. W. Bush earns around $4 million annually in fees for about fifty such appearances. Even before he left office, Bill Clinton was being booked for talks for as much as $150,000 apiece.